Phil Hare is the 'Potato man, the spud u like, the chip on your shoulder,' the cutting-edge lyricist-guitarist-humourist, that audiences love. He's got it all and is widely regarded as one of the finest and most distinctive acoustic guitarists working on the current folk music circuit. After serving a 'local apprenticeship' with many well-known names in the North West of England: bands like FULL HOUSE and the FIDDLE BAND, Phil became a solo performer at the end of the 1980's, taking to the road with a powerful, self-written song selection from his self-produced recording 'MAIDENHEAD REVISITED': prompting PAUL ADAMS from FELLSIDE to sign Phil to his record label in 1990. Following a busy spell at FELLSIDE, during which time Phil was regarded as the 'house guitarist', playing on several FELLSIDE releases, not least, his own critically acclaimed album: 'LIVING ON CREDIT', he teamed up with MIKE JOHNSON from 101 RECORDS. The resulting album: 'COMMON GROUND', received some great reviews and confirmed Phil's position as one of the foremost guitarists and songwriters around. Phil's 2003 album 'BROKEN TIMING' covered a more reflective and mature approach to song writing, taking in influences from across the acoustic spectrum. Material from this album is available on the MP3 page. 2005 saw the release of 'TEARS FROM THE TRACKS' an eclectic 18-track tour de force featuring traditional and contemporary material with just solo acoustic guitar and voice. Over the years Phil has been increasingly in demand as a session guitarist. 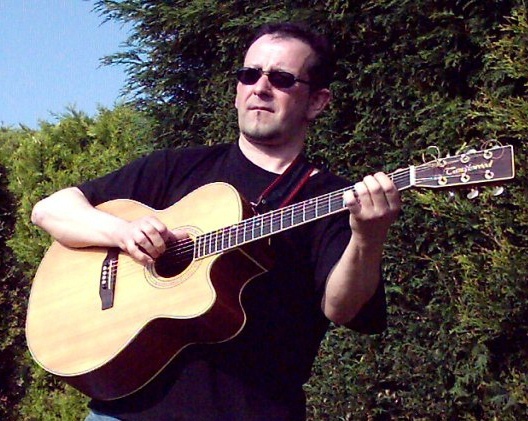 This combined with live performance has seen him work on stage and in the studio with a veritable 'who's who' of traditional and contemporary folk and acoustic musicians. Artists such as the late JAKE THACKERAY, THE SPINNERS, ISLA ST CLAIR, VIN GARBUTT, CHRIS NEWMAN, TOM MCCONVILLE, DAVE BURLAND, BEN & JOE BROUGHTON, BILL CADDICK, BRAM TAYLOR, GARVA, the acoustic rock band PELE (no, it's not him!) DEAN JOHNSON, JON HARVISON and more recently with dance bands TANGLEFOOT, THREE POINT TURN and PANDEMONIUM. It was with the GINGHAM PINKS dance band that Phil played at EDINBURGH FRINGE 2001 where they provided a musical backdrop for JOHNNY VEGAS and NICHOLAS PARSONS amongst others! In addition to regular local and national radio play and performance, Phil has completed British and European tours in the last few years, winning many friends with his combination of finely-crafted and often 'socially aware' chorus songs, a rich, husky voice, a humorous line in stage banter, and, quite simply, some of the best guitar playing you are likely to hear anywhere. IAN WELLS of the DAILY TELEGRAPH wrote: 'If folk song is history from underneath, then Phil's songs are today's broadsides'. The New York based magazine DIRTY LINEN wrote: 'The songs are British, maybe even Northern English, but this guy is clearly a world class player'. 'Some beautiful guitar playing from the vastly underrated Phil Hare 'LIVING TRADITION'.